One of Lincoln's earliest structures. 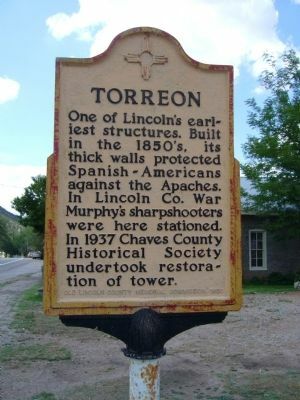 Built in the 1850's, its thick walls protected Spanish-Americans against the Apaches. In Lincoln Co. War Murphy's sharpshooters were here stationed. 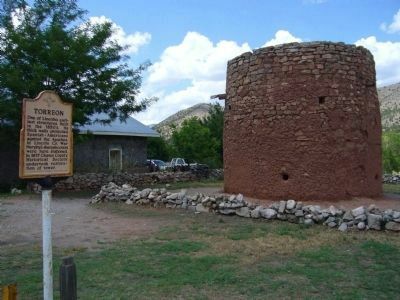 In 1937 Chaves County Historical Society undertook restoration of tower. Location. 33° 29.546′ N, 105° 23.163′ W. Marker is in Lincoln, New Mexico, in Lincoln County. Marker is on U.S. 380 at milepost 97.8, on the right when traveling west. Touch for map. Marker is in this post office area: Lincoln NM 88338, United States of America. Touch for directions. (about 400 feet away); Col. Dudley's Camping Place (about 500 feet away); Montano Store (about 500 feet away). Touch for a list and map of all markers in Lincoln. More. Search the internet for Torreon. Credits. This page was last revised on June 16, 2016. This page originally submitted on August 11, 2011, by Bill Kirchner of Tucson, Arizona. This page has been viewed 621 times since then and 13 times this year. Photos: 1, 2. submitted on August 11, 2011, by Bill Kirchner of Tucson, Arizona. • Syd Whittle was the editor who published this page.